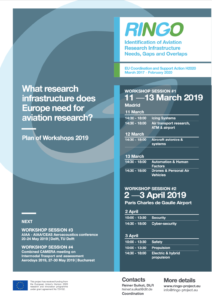 The RINGO project is planning to have soon a series of workshops to collect information about the existing and future needs of aviation research infrastructures. The next workshops will be held on the 11-13th of March 2019 in Madrid (Spain); on the 2-3rd of April 2019 at Charles de Gaulle Airport in Paris (France); on the 21st of May 2019 in Delft (Netherlands); and on the 28th of May 2019 in Bucharest (Romania). Are you an expert in the field of aviation? If so, take part into the workshops and tell us your opinion! 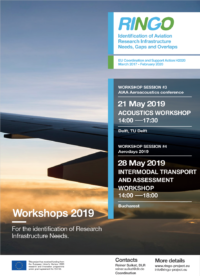 Topics explored will cover icing systems, ATM & airport, aircraft avionics & systems, automation & Human Factors, drones, security & safety, cybersecurity, propulsion, electric & hybrid propulsion, aeroacustics, and intermodal transport. Participation to the workshops is free, but places are limited: submit your request, and we will come back to you to confirm your registration. You can register to each topic separately and attend more than one. Limited budget is available to the project to cover travel and accommodation expenses of the participants: please indicate in the registration form if you need costs coverage. For any further information about the workshops, please contact Jelmer Reitsma.